It is because of her. It must be her whom always give me irrational unbelievable tasks. After 2 months discussion about takir and klepon tart which make us blank and stressed, now she came with the idea about how if I practice, shoot, capture anything (mostly related to food photography) every single day? And the worst part about the challenge is, I accepted it. I even blatantly, foolishly declare to capture anything in 365 days. What a fool me. But hey it’s all because of her. Let’s blame her. Her fault. Not mine. Anyway, to start this ambitious projects (I mean, I just realize that 365 days is a full year. Why didn’t I answered those challenge for only 30 days??? ), I begin with takoyaki. 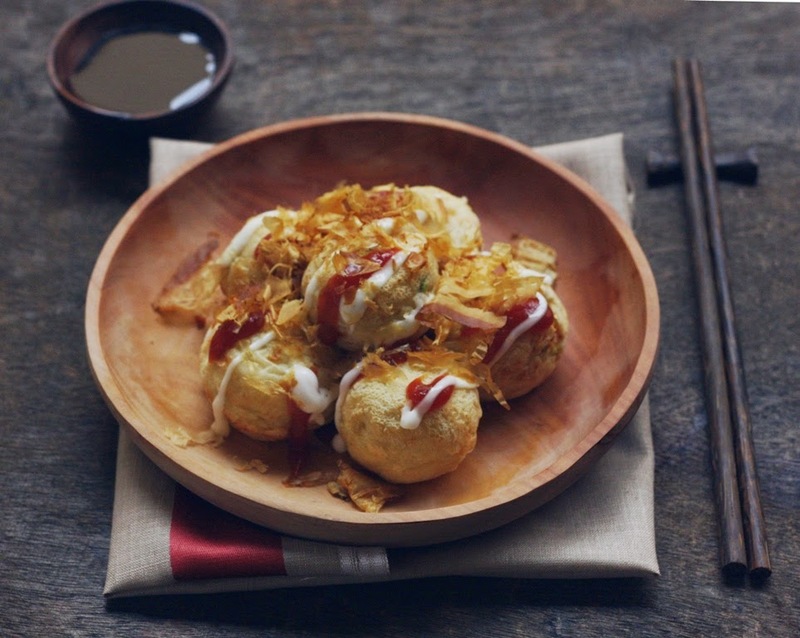 Why takoyaki? Because my poffertjes pan is just arrived and I cant wait to use it! 1. In a large bowl mix well stock, egg, soy sauce, salt and flour with a whisk. 2. Heat a takoyaki pan, use enough oil to coat the pan using paper towel. Pour the batter to each hole. 3. Put octopus pieces in each hole, sprinkle with chopped green onions. 4. Cook at medium heat for 1-2 minutes when the edges are cooked but the center are half cooked, slowly turn over using chopstick so the half cooked batter spill in the hole, pour a little batter, turn until you get a ball shape. Cook another 3-4 minutes, turning constantly.